Globally over 15% of all crop acres are planted with genetically engineered varieties. GE crops are a significant part of modern agriculture and include many traits beyond herbicide tolerance. Large and small farmers alike have benefited from this technology. Insect pests of brinjal (eggplant) force developing world farmers to spray insecticides up to 100 times a growing season. Using genetic engineering, scientists inserted a gene from a common soil bacteria (Bacillus thuringiensis or Bt) into eggplants. The Bt protein is only toxic to target pests and is considered safe for use (whole Bt bacteria) in organic agriculture. The Bt eggplant protects itself from insect attack. Increased yields and reduced insecticide applications have convinced farmers of the benefits of this GE crop. Currently 6000 Bangladesh farmers grow Bt eggplant and Filipino farmers are beginning to explore it as well. Sub Saharan Africa produces a third of the worlds’ banana crop. Banana wilt disease (BXW) threatens most of the banana production in the region. Bananas are sterile and must be propagated by cuttings. Unfortunately this practice has accelerated the spread of the disease. By inserting a gene from a pepper plant, African scientists have developed genetically engineered varieties of BXW resistant bananas. Field trials have been very positive. As GE crop legislation matures in African countries, farmers will gain access to BXW resistant bananas. Globally almost two billion people suffer from malnutrition. Perhaps the greatest need is Vitamin A. Close to a billion people suffer from Vitamin A Deficiency (VAD). This deficiency can cause a wide range of health problems, particularly in the very young. Each year over 100 million pre-school children suffer from VAD, often leading to blindness and death. Scientists have bio-fortified bananas, cassava, potatoes, sorghum and rice with beta carotene (which our bodies turn into Vitamin A). 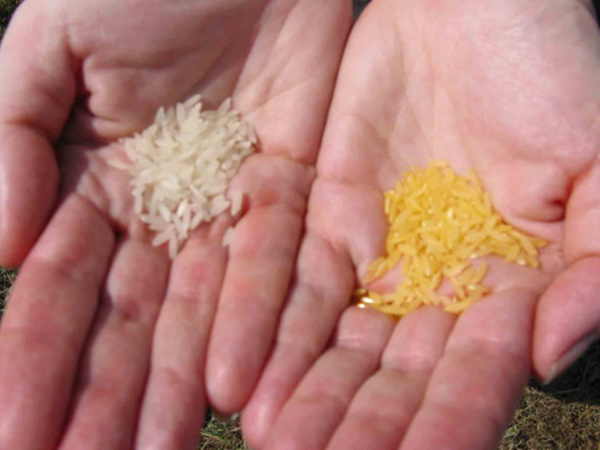 Golden Rice (beta carotene changes the color of rice) is in advanced stages of field trials. Every indication has this rice alleviating VAD in those whose primary food is rice. Other beta carotene bio-fortified crops are working their way through the research and development process. Both traditional breeding and biotechnology are being employed to reduce the massive suffering from VAD. Drought tolerant maize has been available to North American farmers since 2011. 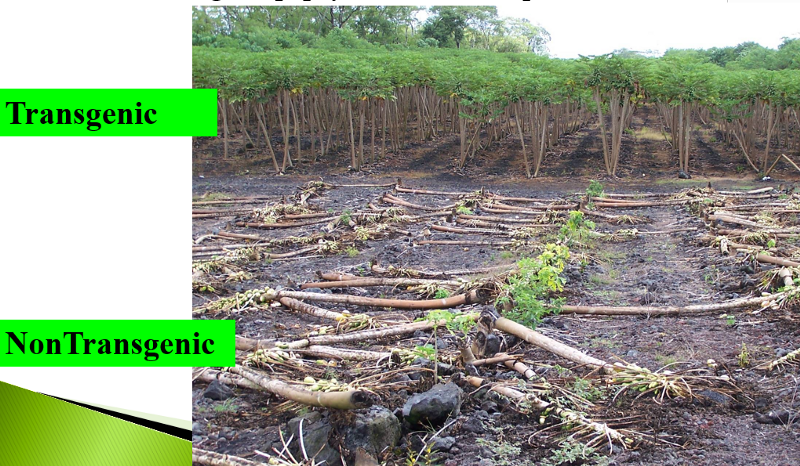 Although 17 countries permit this type of GE crop for food and animal feed, only four allow it to be cultivated. This may soon change. Eastern African countries have been interested in drought tolerance for a long time. Traditional maize breeding for drought tolerance has had some success. Donation of drought tolerant genes by a North American biotech company is starting to show significant yield advantages in African research and development projects. This year, Kenya authorized field trials and Uganda has just passed their biosafety bill, which will facilitate field trials of GE crops in that country. Millions of developing world farmers may soon have access to GE drought tolerant maize. Viral disease in plants often destroys the entire crop. Most plant viruses are spread by biting/sucking insect pests. Traditionally farmers spray broad spectrum insecticides to try to reduce crop losses. There is a better way. Scientists have developed methods that “immunize” crops from viral disease. It is called interfering RNA or RNAi. Similar to vaccines in animals, placing a small part of the virus genes (RNA form) into a plant protects it from the virus attack. The first viral resistant GE crop was the papaya. Papayas suffer from a destructive virus called papaya ring spot virus (PRSV). Scientists at Cornell University used genetic engineering to insert one gene from the PRS virus. The resulting papayas are completely immune to the PRS virus. This GE crop saved the Hawaiian papaya industry. By planting GE papayas, Hawaiian farmers have reduced insecticide spraying, while maintaining good yields. Today, over 85% of all the papayas grown in Hawaii are genetically engineered to resist PRSV. Variation in the PRSV around the world has encouraged other papaya growing countries to develop their own ring spot resistant GE varieties. Five hundred million people (many in Sub Saharan Africa) rely on cassava (potato like root crop that grows in poor soil conditions). Brown streak virus (BSV) has become a large problem in this region. African scientists, in collaboration with U.S. scientists, have developed transgenic BSV resistant cassava using the same RNAi technique that is so successful in papayas. African farmers may soon have access to this GE crop. Fungus produce some of the most toxic compounds on the planet. Fungal toxins impair the immune system, stunt growth in children and can be carcinogenic. North America, Europe and most of the developed world have strict enforcement of fungal toxin levels in food and feed. Unfortunately in the developing world, a significant amount of highly contaminated food still reaches the market. Billions of people in the developing world suffer from fungus contaminated food. Collaborative research between CGIAR (formerly the Consultative Group for International Agricultural Research), and their U.S. partners has produced a fungus resistant groundnut. The research project blocked fungal infection of the nuts with fungal resistance genes and fungal toxin production with RNAi. There is every reason to believe this research methodology can lead to the development of many safer food crops. The past decade has seen a dramatic increase in GE crops grown in the developing world. In fact today the developing world grows more acres of GE crops than the developed world. With the advancements in research and development of GE crops in Africa (figure nine) there is every reason to believe significant GE crop advances will soon reach their farmers. The first twenty years of GE crops dealt mainly with traits that benefited farmers (better weed control and insect resistance). Along with reduced environmental impact, the future will see many GE products that benefit the consumer. More abundant, healthier and nutritionally enhanced GE crops will be common. Soon 9–10 billion people will inhabit the planet. We will need the best of every form of agriculture if we are to feed everyone on the same amount of land more sustainably. -Written by Rob Wager in Medium.com. See original article link here.